Ever since the war, efforts have been made by groups and individuals to get refugees into Canada but we have fought all along to protect ourselves against the admission of such stateless persons without passports, for the reason that coming out of the maelstrom of war, some of them are liable to go on the rocks and when they become public charges, we have to keep them for the balance of their lives. F.C. Blair, Director, Immigration Branch, 1938. [A]s human beings we should do our best to provide as much sanctuary as we can for those people who can get away. I say we should do that because these people are human and deserve that consideration, and because we are human and ought to act in that way. Stanley Knowles, MP, House of Commons, 9 July 1943. Separated by a mere five years, these two statements reveal much about the historic contradictions of the Canadian approach in dealing with refugee crises. In fact, remove the dates and these statements would not seem out of place in the current Canadian divide over the global refugee crisis in which there are more than 60 million people fleeing war, persecution, and danger. This is a number that surpasses the amount of displaced persons at the end of the Second World War, when my father and my grandparents fled Hungary by train and horse-led wagons to come to Canada in April of 1951, but not before spending six years stateless in Austria. They were among the more than 120,000 refugees who made their way to Canada between 1947 and 1953, thanks to contract labour schemes or government, family or church group sponsorships. Make no mistake, the selection criteria were guided by racial and political bias, along with a heavy dose of economic self-interest. Hungarian Refugees arrive in Canada, 1957. Archives of Ontario, F1405-19-60, SR.14500. Of all the elements of Canada’s immigration policy, those relating to the admission of refugees have been the most controversial and the most criticized. But for much of Canadian immigration history, neither politicians nor public officials made any distinction between immigrants and refugees. It was not until the passage of the 1976 Immigration Act that refugees constituted an admissible class for resettlement. Until that time, special refugee admission schemes were made possible only with the passage of orders-in-council which suspended normal immigration regulations and permitted relaxed criteria for screening. Fast forward to 2015 and a United Nations report reveals that Canada is at the bottom of a top-15 list of industrialized receiving countries, with 13,500 claims reported in 2014. In comparison, Sweden, a small Nordic country with 9.6 million people and a quarter of Canada’s population, admitted 75,100 refugees last year. In January the Conservatives pledged to accept 10,000 Syrian refugees over a period of three years, of which Immigration Minister Chris Alexander reported 2,500 are now in Canada. In a crass display of politicking last month, the Conservatives promised to increase this number by an additional 10,000 over four years if they are re-elected in October. Sadly, this is a meaningless number, amidst an increasingly shameful Canadian response to ongoing refugee crises over the last 15 years. We weren’t always so unwelcoming. Nor have we offered an open door since the end of World War II. I would argue that the reputation we have (or had) as a world leader in protecting refugees is due largely to the concerned Canadians who have called on our political leaders to ‘do more’. The UNHCR recognized this when it awarded the Canadian people the Nansen Medal in 1986. In 1956 it was the Canadian people, acting in concert with humanitarian and voluntary agencies (the Canadian Red Cross in particular), who called on the government of Louis St. Laurent to take in Hungarians fleeing the violent Soviet repression of the Hungarian revolution. In response to significant public pressure, Canadian immigration officials reinforced the number of immigration officers at the Canadian Embassy in Vienna, loosened the normal requirements concerning proper travel documentation, medical exams and security clearances, and enlisted commercial airplanes to transport the refugees out of Austria. The Canadian government increased monetary aid to the CRC by emphasizing that substantial emergency relief would serve as a replacement for military intervention. The effort produced impressive results: by the end of 1957, more than 37,000 Hungarians had been accepted into Canada. This was done despite domestic economic concerns, including a rising unemployment rate. But the reception of the Hungarian refugees played well into the Cold War rhetoric of the time. Thanks to this wellspring of Canadian support, my great aunt and uncle came to Canada in January of 1957, following a harrowing crossing over the Hungarian-Austrian border. It was actually my great uncle’s second try; he was arrested the first time and sent to a Soviet work camp. His friend wasn’t so lucky; he was shot by a Russian border guard. They are so thankful to this day for the chance to live in Canada. In fact, visit any Magyarhaz (Hungarian Hall) in Canada and you will likely find events commemorating the reception of the ‘56ers, and quite possibly a photo of J. L. Pickersgill, the Minister of Immigration at the time, who actually travelled to the refugee camps to personally assess the situation. Still, the Hungarian refugee crisis is telling of the limits of what individuals can do in an international system founded on the primacy of the nation-state. While the response of Canadians was an important catalyst for mobilizing action around the cause of refugee rights, the crisis had the unanticipated effect of heightening expectations to what proved to be unrealistic levels. For some groups, the Hungarian crisis was not a “one-off”, but rather the standard to which future national responses to humanitarian crises should aspire. Indeed, the success of the Hungarian resettlement program for Canada served as a convenient precedent when in subsequent years, individuals and groups urged the government to act on other refugee crises. While the Hungarian refugees were fleeing a Communist state and welcomed as democratic refugees, Chilean refugees fleeing a fascist state were viewed with suspicion. In 1973 over 7,000 Chilean and other Latin American refugees were admitted to Canada after the violent overthrow of Salvador Allende’s democratically elected Socialist–Communist government. Chilean and non–Chilean supporters of the old regime then fled the oppression directed against them by Chile’s new military ruler, General Pinochet, in the wake of the coup. Although Canada took the refugees in, it did so grudgingly—at least initially. Despite pressure from Amnesty International, church, labour, and Latino groups, the government was slow to react, not wanting to antagonize Chile’s new administration or the United States, which had deplored Chile’s slide into economic chaos under Allende. Many in the Pierre Trudeau government painted the Chilean refugees as subversives and dangerous to Canada. This was certainly out of step with the views of the Canadian population, many of whom were urging the government, by way of various organizations, to accept the refugees as they had done during past crises. The government was also out of step with the efforts of other nations, including Holland and Sweden, who treated the Chilean refugees outside the normal flow of immigrants. Only after considerable outcry from various civil society groups did the situation change. But not all Canadians were of the same mind. The January 14, 1974 edition of the Toronto Star carried a photo of a small group of demonstrators parading in front of the Walker House Hotel, where a group of recently arrived Chileans were being temporarily housed. 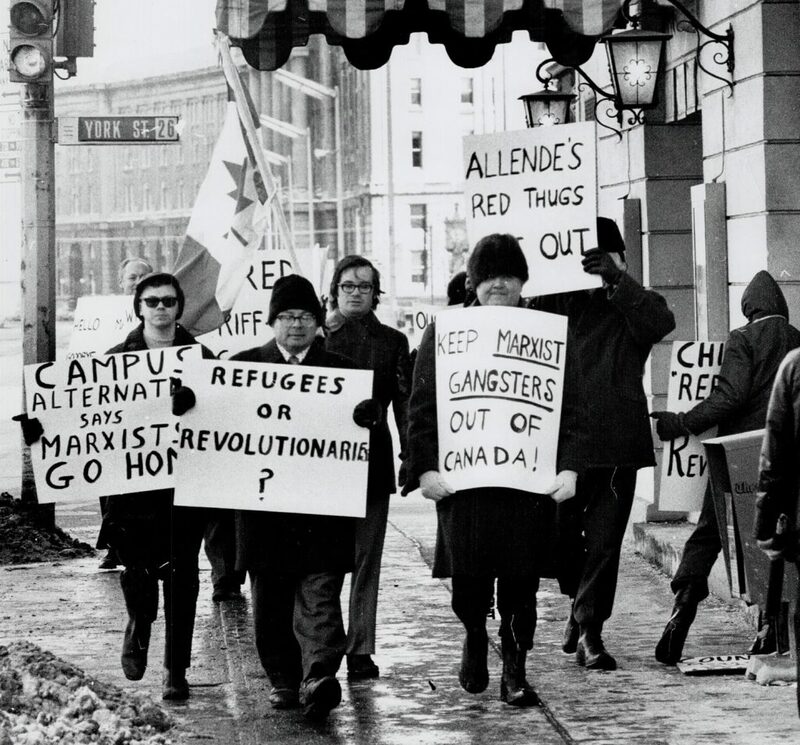 Carrying placards bearing statements such as “Death to the Red Pest”, “No More Marxists – FLQ was enough”, and “Keep Marxist Gangsters Out of Canada”, they claimed to be “objecting to Canadian tax money being spent on ‘riff raff’”. The slow response in the Chilean case led many to become increasingly suspicious of Ottawa’s commitment to refugees. 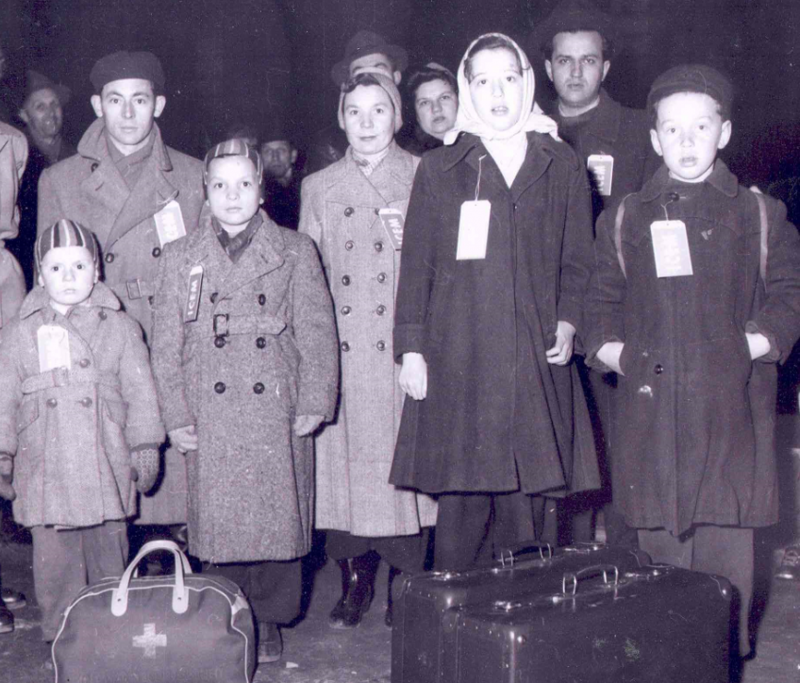 As several scholars of Canadian immigration and refugee policy have noted, the response to the crisis helped to foster the perception that the federal government was far more willing to accommodate refugees fleeing communist regimes on the left than those escaping fascist regimes on the right. This was made abundantly clear by the late 1970s, as Canada’s response to the “boat people” of Vietnam fleeing a leftist government was in significantly marked contrast to that which was extended, and continued to be extended to victims of right-wing regimes such as that in Chile. Protest against Chilean refugees, Toronto. Harold Barkley/Toronto Star, 1974. Toronto Public Library, tspa_0012853f. By mid-1979, nearly 1.5 million refugees had fled their homes in Southeast Asia. In June of 1979, the Canadian government announced that 60,000 Indochinese refugees would be resettled by the end of 1980. Thousands of Canadians came forward to welcome refugees, giving a dramatic launch to the new Private Sponsorship of Refugees Program. Popular pressure forced the government to adjust upwards its initial commitment to resettling the refugees. For the years 1978-81, refugees made up 25% of all immigrants to Canada. In the summer of 1999, several hundred undocumented Fujianese migrants (Chinese from Fujian province) arrived on Canada’s west coast, precipitating what many in the news media described as an immigration and refugee “crisis”. News coverage of these events precipitated a process of collective hand-wringing and teeth-gnashing, the result of which was that the refugees were portrayed as an embodiment of danger, a threat to the physical, moral and political security and well-being of the nation. The alarmist reaction of the Canadian government, and Canadians, to the arrival of a vessel called the MV Sun Sea carrying Tamil refugee claimants to the West Coast in October of 2010 is consistent with our mixed history. Public Safety Minister Vic Toews warned that this was a test boat, that there would be more boat loads of Tamils arriving to overwhelm the Canadian refugee system, that the passengers might include Tamil Tigers bent on infiltrating Canada, and the whole enterprise was being driven by criminal smugglers. In reality, there were 492 claimants on the vessel, which was about 1.5% of the nearly 34,000 refugee claims Canada received that year. In response to the crisis, Toews declared that Canada should “get tough”, incarcerate all of the passengers, and possibly seek new laws to fend off this latest threat to Canada. As a result the federal government passed Bill C-31, known as the Protecting Canada’s Immigration System Act. To say that this piece of legislation has been soundly rejected by a variety of civil society groups would be an understatement. So here are some numbers, again: in 1956 we took in some 37,000 Hungarian refugees. In 1968 we took in 10,000 Czechoslovakian refugees in the aftermath of the Prague Spring. In 1972, 8,000 Ugandan Asians were welcomed to Canada, and then about 60,000 Indochinese ‘boat people’ were also welcomed as refugees. In the 1990s over 11,000 refugees from the breakup of Yugoslavia made their way from Bosnia and Kosovo to Canada. And in the past decade nearly 14,000 people fleeing the ongoing civil war in Colombia have come to Canada. How many refugees is the right number? What is the right number? There’s no right answer, of course. Let’s face it: our record is mixed, even as most Canadians seem to favour asylum provision. No one should forget that in 1930s Canada, “none [was] too many” for Jewish refugees fleeing Nazi Germany. More recently we have seen cuts to refugee health care, mandatory detention for “irregular” arrivals (including children), and government money spent on billboards in Hungary to stem the tide of Roma asylum seekers to Canada. This is what passes for bold intervention these days. Our history with respect to refugee reception may be complicated, but over the last 10 years it has risked becoming contemptible – again. Confronting Canadian Migration History by Stephanie Bangarth is licensed under a Creative Commons Attribution-ShareAlike 4.0 International License, except where otherwise noted.